The most commonly available map of Colombia (outside the country) is the widely available one from ITMB (International Travel Maps). As usual theirs is quite poor, but since it was the only one we could get before arriving in the country, we bought it. However, we were able to get some excellent map resources at the national institute of geography, the Instituto Geográfico Agustín Codazzi, and that did us very well. 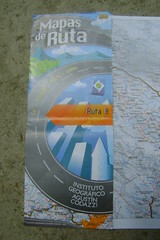 They offered a number of maps, but we bought their set of route maps "Mapas de Ruta", that gave 1:750,000 renditions of the major highway stretches of the whole country. There are also a couple of widely available travel guides for the country, with lots of great information, but they're big glossy books with lots of ads and they're extremely heavy. One of these is the Guia de Rutas Por Colombia and another is published by the big telephone company Telefonica. The GPS maps we used don't seem to be available, but a helpful visitor commented "If you are looking for very good maps for tha garmin GPS try Gisco at www.mygisco.com."